An Open Letter About Climate to U.S. Politicians Running for Office in 2018 | Watts Up With That? Actually, President Bush was quite right to reject the Kyoto protocol. …Kyoto was an anti-growth, anti-capitalist, anti-American project which no American leader alert to his country’s national interests could have supported. It has been argued the global wealth-distributing Paris Agreement was even worse for the United States. 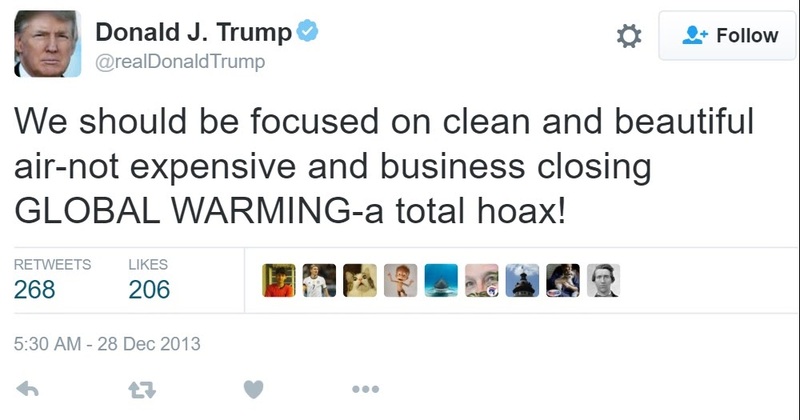 That leads to a question: Were you in favor of the “anti-growth, anti-capitalist, anti-American” Kyoto Protocol and Paris Agreement? When used at the right time and in the right context, Thatcher’s words could be more than helpful to some of you and very damaging to others. For Land Surface Air Temperature Extremes for the Contiguous U.S.—Basically Heat Waves and Cold Spells—The Hottest Yearly High (TMAX) Land Surface Air Temperatures Were Higher in the 1930s Than They Have Been in Recent Decades and the Coldest Yearly Low [TMIN] Land Surface Air Temperatures Have Increased since 1900 (NOAA NCDC – National Climatic Data Center, now known as the NCEI – National Centers for Environmental Information.) Note: These Surface Temperature Data Were Presented in Absolute Form, in Deg F, NOT As Anomalies. Of course, Dad, Is Climate Getting Worse in the United States? contains hyperlinks to the data so that anyone can confirm the data presentations. Also, you’re more than welcome to use any graph from either book if, and only if, you cite its source. Best of luck to many of you. To others, adios. I have read that Thatcher was the first politician to use the Greenhouse gas argument when she advocated for nuclear energy over coal. The coal miners unions where giving her headaches. My reccollection of the miner’s strike was that there was massive overproduction of coal at the time. This had allowed massive stockpiling at all of our coal fired power stations. I thought at the time that this must have been deliberate as it was pretty likely that Arthur Scargill would call another national strike. Whereas the earlier strike had caused power cuts and other problems, this strike lasted a whole year and had almost no effect. I think it lasted longer actually. My memory might be at fault but I seem to recall the miners doing a “victory” parade on the first anniversary of the start of the strike. The working class heroes marching back to work, bravely celebrating being comprehensively routed. I am convinced she never imagined that the warmists would take it that far. I understand this was a fast excuse to tame the coal mining union. Brown going to the world financial markets for a bail-out for Sterling and of course the famous or infamous “Winter of Discontent. “By that stage unions had lost all public sympathy and Labour itself had closed mines. It was 5 years before the idiot Scargill tried to take on the Tories and Thatcher had ensured that coal supplies were at a maximum and most households had converted to natural gas. A friend , son of a miner but himself an academic commuting to Bristol each week, said that he saw the huge piles of coal at Didcot power station and knew that the miners’ dispute of 1984/5 was a lost cause. Pretend I said “One of the first”. Denis Healey was the Chancellor of the Exchequer, not Brown. Neither George Brown, nor Gordon Brown. Nor any other Brown . . . .
That may be, but Thatcher was 10 years out of office when she wrote STATECRAFT. Apparently, she no longer had agendas. China is off the charts……..
China is off the charts (RE CO2 emissions) in no small part because the US imports so much of their stuff. The US, and the rest of the world. BTW, manufacturing hasn’t fallen in the US. It just hasn’t grown as fast as other places. What has fallen has been manufacturing employment, and that is due to improved productivity. China is off the charts because they have no regulations and don’t give a flying crap…. And move manf back to the USA where we promote human rights. 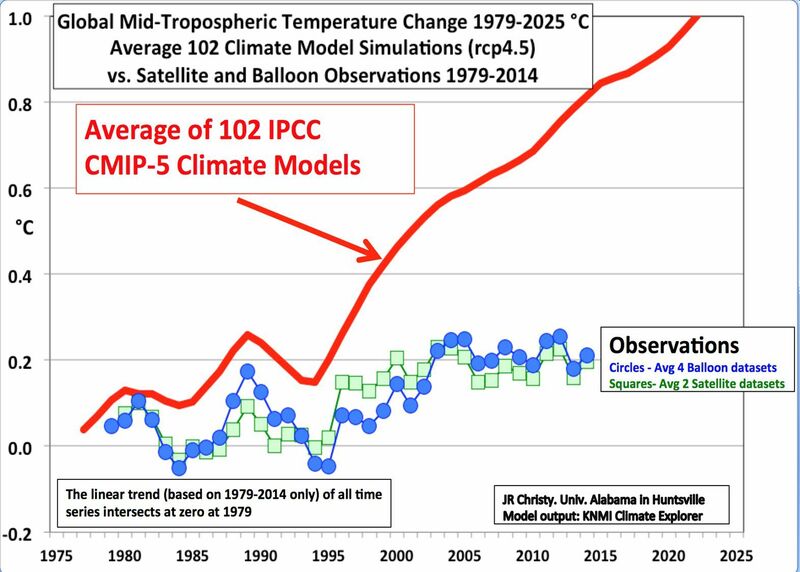 And of course, despite feeble hand-waving attempts of some government climate scientists, the CMIP3/5 climate model ensemble predicted signature finger-print of water vapor amplification of the CO2 GHE, that is the tropical hot spot in the mid-troposphere, is not observed after 39 years of satellite measurements. Which means CO2 GHE water vapor feedback is not positive, but likely negative or near neutral. And climate sensitivity to 2xCO2 is simply the CO2 component alone, likely in the 1.0 – 1.8 K range, but no higher. If the “consensus” theory’s signature fingerprint prediction is unable to be found after such a period with continually rising GHG emissions, the strong CO2-GHG theory must be rejected. There is simply no 2.0 – 4.5 K per 2xCO2 sensitivity. It will only be with more feeble hand-waving, and distraction to other dubious claims, that the “consensus” can continue to claim the climate is worsening. The 1 degree on doubling CO2 (not including feedbacks) comes from valid computer calculations of net infrared (IR) absorption by CO2 molecules in a cloudless troposphere. But 62% of the Earth’s surface is covered by clouds which act as black bodies at IR frequencies (absorbing 100% and then re-emitting from the cooler cloud tops). Doubling CO2 has no net effect below the cloud tops (you can’t increase absorption beyond 100%), and the initial IR emission from cool cloud tops will be less than that from a 288 K (15 Celsius) solid or liquid Earth (see the Stefan-Boltzmann Law). There will be fewer CO2 molecules in the shorter path length from cloud top to 10 km, compared to from the Earth’s hard deck surface, so absorption in the non-saturated lines will be less. The non-saturated lines are primarily in two sidebands (see the very small difference in area between the green and blue curves in the MODTRAN spectrum available at https://en.wikipedia.org/wiki/Radiative_forcing ), and involve absorption by CO2 molecules in the v=1 first excited state, not the v=0 vibrational ground state. The v=1 molecules constitute only about 3% of the total number of molecules at 288 K (hence the lines are not totally saturated even in the entire 10 km path length of the troposphere), but the percentage goes down exponentially with decreasing temperature at higher altitudes. So the 3 factors all mean that there will be considerably less IR absorption by CO2 above clouded areas of the Earth. My estimate for the Earth as a whole is around 0.6 K, not 1 K. Positive feedback from increased water vapor on warming by 0.6 K might increase this to 0.8 to 0.9 K max., but a slight increase in cloud cover (note that in the tropics, as the Sun rises, water vapor increases, but then clouds form which increase the albedo) will reduce equilibrium climate sensitivity to 0.6 to 0.7 K, a factor of 4 to 5 smaller than the IPCC’s wrong value of 3 K.
I can email detailed calculations if you contact me at rtaguchi @ rogers.com . What a great short article. I hope some of the politicians will have a short look at the the data you presented. Additionally I think it is important for the main stream politicians to have arguments that reflect positively in the voters brain, like the personal cost of supporting CAGW, and how much more wonderful life is without doomsday religion. So maybe I was missing a bit of the money side in the article. The campaigns haven’t really started yet, except for primaries, but I doubt the Democrats will stress climate change except as a tool to bash Trump. God have mercy on us poor sinners. The issue/problem isn’t with the facts. It’s getting the MSM to recognize the facts and give them to the people. HA HA! Good one. Not a chance in H E double toothpicks. You’re assuming the MSM is an independent entity interested in gathering facts. It isn’t and they aren’t. They sold their souls decades ago the international banking cabal who own them, Murdoch being Oz’s ‘fixer’ with a pocketful of blank checks to purchase and winnow any semblance of independent MSM reporting. The so-called fourth estate has been walking the streets for these bankers for years. I highly recommend all US readers of this article forward it to your local and state politicians. Then attend their next ‘town hall’ meeting and ask them for their position on mannmade global warming and the hazards of CO2 essential plant food. Capitalism has some serious problems. Democracy has some serious problems. There are many who would replace capitalism and democracy with something that looks suspiciously like Marxism. Marxism is like renewable energy. It looks great on paper … if you’re an academic and you don’t know anything beyond your own very narrow specialty. The thing is that the demonstrated problems with Marxism are way way worse than the problems with capitalism and democracy. So, should we replace Capitalism and Democracy, which mostly work OK, with Marxism, which has never worked on a large scale, and probably can’t possibly work? Well duh! The US is not a democracy, it is a representative republic. The founders and authors of the constitution were well aware of the flaws of democracy from Athenian history, and attempted to design a system hardened from such flaws. Unfortunately, the progressives of the early 20th century began to claim that the US was a democracy, and this inaccuracy has grown in acceptance since then. In practice, the US government is more like a democracy now, although the formal constitutional structure is still that of a representative republic. Polisci semantics! “representative” is the democracy part. People like to state this no democracy homily. The US founding Fathers hated democracy, which they called “mobocracies”. They knew from history that democracies always fell as soon as citizens realized they could vote themselves more and more of other people’s money. To avoid this inherent problem of democracies, the US Constitution only allowed the Federal governemnt to spend money on 17 enumerated tasks, with all other matters to be supplied by: individuals, the private sector, charities, or by the various state and local governments (in that order). The Constitution’s complex system of checks and balances also made spending bills extremely difficult and time consuming to pass, which also inhibited government spending/growth. America’s Constitutional Republic functioned very well until the early 20th century, with total Federal and State spending only consuming 6~7% of US’ GDP. Then Hagelism (precursor of Communism/Socialism/Progessivism) took hold from Wilson’s presidency (who hated the Constitution) and now Federal, State, Local and regulation compliance costs consume 50% of US GDP..
Granted, the US Constitution as written no longer exists and we’ve become another failed democracy with $22 trillion in national debt, $100+ trillion in unfunded liabilities, $2 trillion/year in regulation compliance costs and $1 trillion/year budget deficits.. The problems started with the adoption of the 17th Amendment. This amendment changed the way Senators were put into office. Originally Senators were to be appointed by State legislatures, thereby representing the States in our federal government. The 17th made election of Senators by direct vote of the people, the argument being it was more democratic. But Senators were never intended to represent the democracy of the people, that fell to the House of Representatives (thus the name). The Senate is supposed to be the voice of the States in the government, while the House is the voice of the people. Thanks again Bob, we have a fairly popular, conservative, first-time-politician running in our house district, and I’m going to point him toward this piece. Have a wonderful Labor Day Holiday, Bob! I do not care if the far right make gains in the upcoming elections in the USA in fact I do not care for the far right . The climate change argument has become too much to do with politics and the USA for me and the UK has perhaps changed since the Thatcher period so those views don’t represent what the people in the UK think now I am afraid. Where do you stand? I proudly stand on the “far right” of that spectrum. Kyoto treaty rejected by the US Senate 95-0. Kyoto was never presented to the US Senate. I wouldn’t know the first thing about writing a letter, but inferring the recipients are suspect of an agenda and then being downright rude, might not be the best method for……..further communication. Only Trump can get away with that. u.k.(us), I reread my post once again, and I don’t find anything rude about it. Let me put it this way, I know you can do way better. I didn’t see anything rude about it, either. I don’t know what u.k. refers to. Pointing out all the reductions in severe weather events over history, as this article does, will be a powerful argument for those opposing the CAGW promoters. You are welcome Bob Tisdale and Anthony Watts! Politicians know politics but they don’t know science very well so it needs to be kept simple. Dr. John Christy’s Chart Chart is a step in that direction. The benefits of carbon dioxide needs to be pointed out. A while back, global warming came up in my monthly breakfast club and when I told the guys that “Every carbon atom in your body was once CO2 in the atmosphere.” I could tell that they never realized that before. On a similar note, two thirds of the oxygen in the air was also once CO2. A simple 8th grade level primer on photosynthesis might be the ticket. Part of keeping it simple, is letting politicians know that we are actually living in an Ice Age. “In the terminology of glaciology, ice age implies the presence of extensive ice sheets in both northern and southern hemispheres. By this definition, we are in an interglacial period—the Holocene—of the ice age. It began and it has not ended. We in Ice Age and currently during a part of Ice Age called an interglacial period- which sea levels aren’t 100 meters lower and there is not a mile high of glacial ice covering North American. It requires modern stupid to think that warming is somehow undesirable. It should also be pointed out that US is no longer a country which emits the most CO2 [not that there any wrong with emitting CO2] but China emits twice as much as US, and mainly due to China burning 4 times more coal than US. And US is burning less Coal because fracking has caused US to be biggest producer of natural gas. Natural creates less CO2 when used to make same amount of Electrical energy as compared to using coal. Or China could have about same CO2 emission as US if they had lower energy mix of coal [as US has] by using more natural gas. Of course other thing is natural gas causes less pollution- so less Chinese would die from pollution if China used less coal and more natural gas. Pols would tend to think it’s due to better energy efficiency, but that is not the main factor. Or said differently, better efficiency is not going to do much to lower China’s emission or nor do much solve it’s massive pollution problems. China is going to eventually reduce their reliance on coal, or they’re going to improve their coal plants to produce less pollution. They’ll be happy to loan us some money so we can pay them to make progress on that front, but their true motivation will be that as their citizenry becomes more wealthy, it demands more luxury goods — like breathable air. Google is not nice. I just wrote an email to Jimmie Åkesson, the party leader for Sweden’s third largest party SD. This is election time in Sweden and I already casted my vote. The thing is, that I am not very good at Swedish, so I had Google translate to help me – oh dear, it was deliberately trying to translate my Danish writing in such a way, that everything about climate and CO2 got the negated meaning. What Google did not know, I am able to read Swedish quite well. Sorry for my bad Swedish, I am Danish and lives in Sweden since 2005. I have already voted for Sveriges demokrater and found that you defended yourself well during the TV debate. There is just one thing that bothers me, the climate change. Maybe you are afraid to loose votes by supporting the plant food COS. I assume that You and your colleagues read English. Bob Tisdale recently wrote a small peace to politicians. Here is a link to the article, in addition to my comment to the article. It is short, but surely worth reading. Thanks Bob! Nice job as usual. In reality ‘climate doom ‘ has been an election virtual none-issue across much of the world for years . And that is very telling . Writing for impact: “anti-growth, anti-capitalist, anti-American” Kyoto Protocol and Paris Agreement? Change that to anti-growth, anti-people, anti-capitalist Kyoto Protocol and Paris Agreement. That deemphasizes the hot button words and makes the point that people world wide would be hurt. A great letter from Bob Tisdale. The intelligent politicians will already agree with this position, the stupid ones may no even be able to read it. You have to be a complete dolt or Californian not to see that climate scare is about funding expensive projects like cost over runs for high speed rail or island tourism projects like airports or resorts. Re. the “Piles of coal”at the UK power stations in Margaret Thatchers time. A good example of a Solar battery, much better than todays 8 minute one here in South Australia. Throw a few more goats in the volcano, that’ll fix it. Why limit it to a few “Old Goats”? This calls for more than a “few”, and virgins will do if you wanna be effective. No chance a federal politician will bring up climate change. It is electoral suicide. Believe in CC almost certain. Use it for keeping activists liking them naturally. CC is not a key issue. open letter? or shilling ur books.? Suggesting Bob is being dishonest is dishonest.